On March 21, the Youth Design Team was delighted to display our pop-up exhibition at Benito Juarez High School. The number of participants that attended our first exhibition was remarkable and all of the visitors seemed to enjoy and appreciate the hard work that went into the five panels and accompanying inter-actives. This also marked a time when we became less of a collection of independent duos and trios and more of a team, working together to achieve our goals. The day started when the nine YDT members met up with our two YDT instructors at The Field Museum. Each team member received a sheet listing the jobs that needed to be accomplished and the names of those assigned to each job. 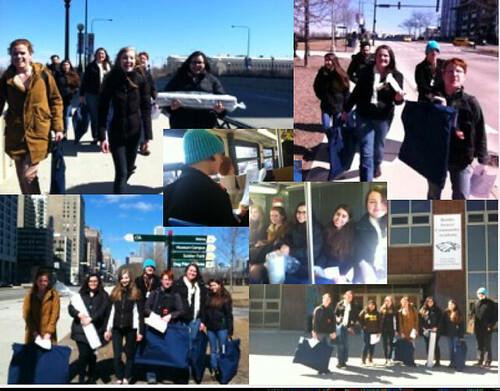 We then collected all the pop-up exhibition components, left the Museum, and made our way to a CTA bus stop. Over the span of the bus ride, each of the team members had a chance to look over the job assignment sheet. Once we reached the Loomis St. stop, the team filed out and walked the rest of the way to Benito Juarez High School. We assembled our exhibition and excitedly awaited students to arrive and review it. When they did arrive, the teens and their teachers meandered around the exhibition, scanning the many meticulously scripted paragraphs comprised by our Content Specialists, and thoughtfully watched the three short films directed and produced by me, the team’s “video man”. The students observed the fine details of lively illustrations and serene watermark-like backgrounds added to the banners by the Graphic Design Team. Halfway through, several of us YDTers debated whether or not to perform Michael Jackson’s Thriller dance to attract attention to the interactive department’s “Zombie Apocalypse Survival” app. At 4:00 we started to disassemble the elements that formulated the pop-up and made our way back to the Field, happy with the outcome of our first pop-up and even more elated at the prospect of popping-up the next week at the YOUmedia Center in the CPL’s Harold Washington Library.